RTD Rail uses proof of payment fare system. All riders must have a valid ticket or pass prior to boarding. Ticket machines are available at all stations. Before you board the RTD Rail, you need to buy a ticket or pass from a RTD Light Rail ticket machine located at every station. At some stations, machines are located on one of the two platforms only. At elevated or underground stations, ticket machines are located at the station entrances. Paper transfer from the bus is also accepted on the RTD Rail. The RTD Rail system has multiple fare zones and fares are charged according to the number of zones traveled. When buying one way ticket or day pass, select the destination and fares will be calculated automatically. Quick ticket option is available for trips to Downtown Denver. A one way ticket is good for the next 90 minutes to travel on the rail. Riders with 10-ride ticket book or free ride coupon should validate the ticket at a validator at the rail station. On the platform, board the train that goes to your station. The headsign on the vehicle will show the line letter and destination, and the same information will be announced when the train is at the station. 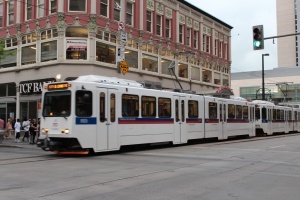 Bicycles can be taken aboard the RTD rail at all hours on all cars with no additional fare. 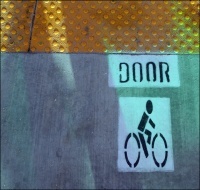 Board the train through the rear door of the first car, or the front and rear doors of the 2nd and 3rd car, as indicated by the bike boarding markings on the platform by the yellow warning tiles. Only to bikes per marking. Stand with the bike by the door area against the operator cab. Bikes are not permitted in the front portion of the front car where it is reserved for people with disabilities. Each vehicle has two multipurpose storage areas. Each area can hold two bikes (4 total per rail car). Selected rail stations offers bicycle racks and/or lockers. Some locations also offer B-cycle bike sharing service. On the light rail, passengers needing level boarding access (wheelchairs, walker, and baby strollers) should wait on top of the wheelchair ramp located on every platform, where it matches the front end of the trains. On the commuter rail, all stations offer level boarding access to all rail cars.